For fifteen days, I have consumed nothing but eggs, chicken, bread, sweet potatoes, apples, avocado, spinach and water. Can I have a Diet Dr. Pepper yet? Just kidding. We are still holding strong. Ish. ~I am developing quite the taste for pepper. I never used to use it hardly at all, but when it is one of your two choices for seasonings, beggars can’t be choosers, right? ~We. Miss. Cheese. The end. 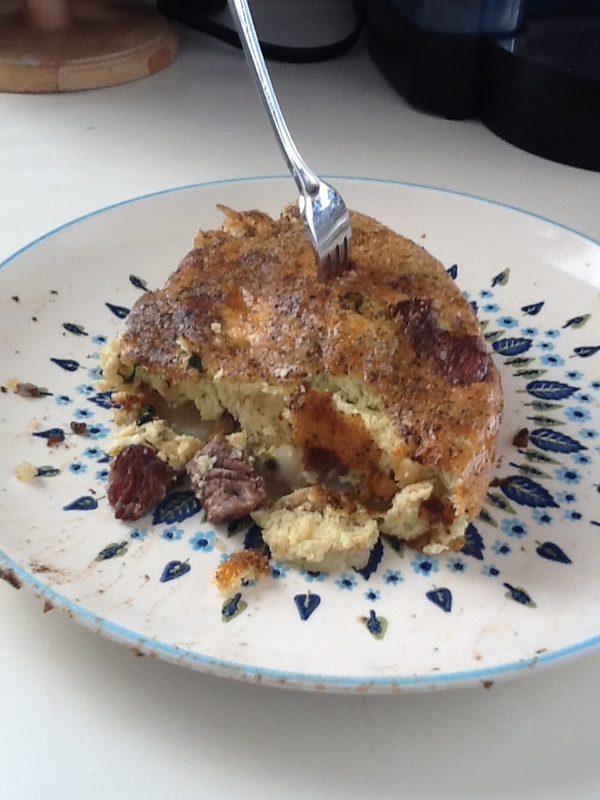 Our latest invention: My hubby’s deluxe frittata, complete with eggs, steak, and potatoes. His thoughts? “It’s good, wife… But would be better with cheese.” Sigh. Isn’t everything, sweetheart? ~Traveling and fasting is HARD, especially with these dietary restrictions. I *almost* cried last week during our time at Chili’s when I was faced with another chicken avocado sandwich. But God turned it into a HUGE blessing through our latest Factor of 7. ~Huge kudos to my hubby for sticking to his fast even after he hadn’t eaten for more than 18 hours last week after he got out of eye surgery. I had brought a partial loaf of french bread with me to snack on, so he chose to eat it, the provided peanut butter and apple juice post surgery. I was impressed, not gonna lie. ~My time with God has been rich, rich, RICH. I am obsessed with my new Bible. ~It’s been challenging not to get distracted on thinking about how positive this is for our physical bodies and our budget. While those are definitely great, that’s not the point. The purpose of this month is for God to cultivate grateful hearts in us for all of our incredible blessings and to seek His will for our lives, not focus on the numbers on the scale or how our checking account is faring. ~We haven’t cheated. At all. Which kind of blows my mind. It’s been super tempting to say “I quit” or “Screw it, bring me the frozen yogurt/Dr. Pepper/somethingcoveredincheese/justonebiteofchocolate” but we have held strong. Thanks, Jesus. The prize? A gift card to your favorite breakfast restaurant (Winner will determine what restaurant the card is for- perhaps Ihop, Waffle House, Starbucks, Cracker Barrel, Huddle House etc.) That way you can go get yourself a big ol’ plate of eggs for breakfast. Or a heaping, steaming stack of fresh chocolate chip pancakes smothered and covered in syrup, strawberries and maple syrup with a side of bacon, fresh fruit and a Diet Dr. Pepper. (Typing that was a bad idea. I should go eat an apple. Sigh.) Again, leave your comment below of your “egg guess” to win your breakfast gift card of choice! Now if you will excuse me… I am going to go pretend that my apple is a stack of chocolate chip pancakes. Kudos on giving up cheese. I honestly miss cheese a lil bit, but it’s the ketchup that really gets to me lately. Depends on the day I guess! Thanks so much for stopping by and leaving a comment and “egg” guess. I appreciate it! Wow-where did the last 15 days go?? Hard to believe we’re halfway done. I just had some oatmeal and pretended it was eggs 🙂 You mentioned you haven’t cheated at all and good for you! I prefer to use the word deviated and I have a couple times, subbed lettuce for spinach. I haven’t given in to the real cravings for diet Pepsi, a glass of wine or KETCHUP. Oh how I miss ketchup!! Anyway, thanks for letting me come along on this fasting journey with you. Its been a real spiritual eye opener, not to mention how easy grocery shopping is-7 items….boom….done shopping!! I used to wonder around the grocery store trying to decide what I wanted…..so many choices, so much excess-life is simple now, as it should be. Blessings-love you! Ha ha, cheated, deviated– whatever 😉 Good job on hanging in there with us, Ma. We will be chowing down on the ketchup again before we know it! Thanks for your comment– love you! Eggs = 313. I miss you – can’t wait to talk to you after I get my life back. Pray for my defense. As always, you inspire me. Hope Barn is doing well and recovering from his eye surgery. Love you both! Congrats on passing your defense, Master Turkey Buzzard. Proud of you sister and glad God answers our prayers. Barn is doing well… And thanks for your guess. (Isn’t 13 your fav number? I recall that was your b-ball number, right?) Love ya! Eggs = 432. Your fortitude is amazing. I’m ashamed to admit I’d probably be in the Screw it, bring me the [whatever] club. Blessings to you as you continue your journey! Ha ha, no shame in it Susan– it is HARD. There have been several days where it’s been close. But that’s the kicker with blogging your journey. I have a few hundred folks that are holding me accountable. I’d hate to come on here and have to write “Yeah, I gave up.” Thanks for stopping by and hugs back to you from Georgia! 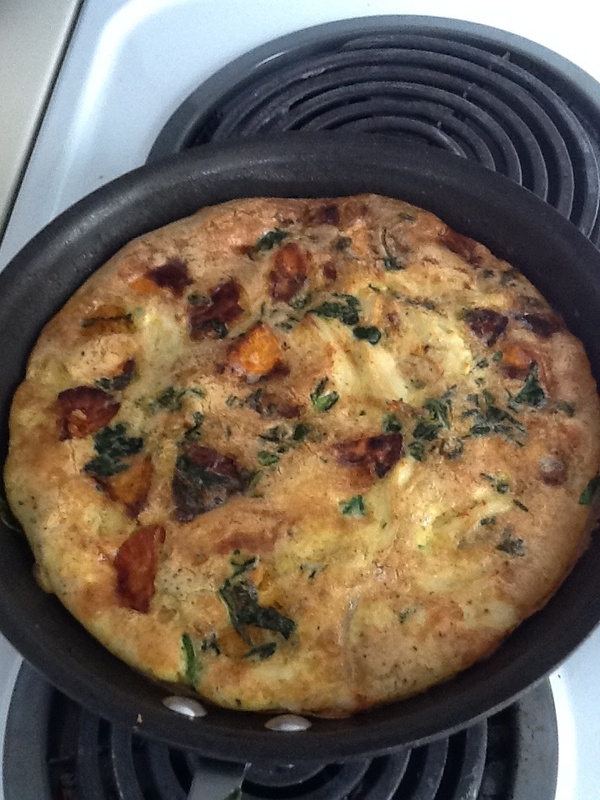 I think that your frittata sounds amazing, without the cheese! Too bad you’re not my neighbor because you would be the perfect candidate for the crazy accumulation of eggs that my momma’s chickens are popping out these days. I guess 353 eggs. It’s really too bad none of Jesus’s great teaching moments included eggs, I mean that could be some sweet coorelation for you. Maybe you could work on a great parable including eggs?! I wish I was your neighbor! My lil bro’s chickens would sure help us on this egg journey too, but alas, KS and GA are a bit too far apart. Thanks for stopping by, Amanda! Congratulations and good luck on your journey! I was on a “whole foods” diet for the past 6 months and feel great. ( no breads, pasta, sugar) You are a very focused, strong woman! Good luck to you and Brandon! Thanks, Laura. Wow, no breads or pasta? Dang. That would be hard. Hope God doesn’t call me to that (JK) But I am thrilled that you feel so great! Awesome. Blessings! Ha ha, thanks cuz… Yep, your egg guess is all we need. Thanks so much for commenting. Love you! I’m impressed. I usually just grab what seems to be hitting my heart at the moment. I AM watching so I won’t gain any wt., but, still, need to be a bit more perfect in some of my choices. My biggest challenge? Avoiding ice cream and/or chocolate. Oh, well. Hang in there Joanne– I don’t even keep “real” ice cream in my house– I keep fat free fro yo or sherbet here for my “cravings.” The hubby gets real ice cream here, but it always has peanuts/peanut butter in it– and since I am allergic, problem solved. Ha. Oh, wow! I love eggs in a salad – sadly, my gallbladder does NOT like eggs in anything – so until next Friday I am living in an egg-free zone:( I don’t know how your diet would work with children in the house – I have a hard enough time eating gall-bladder happy and ensuring they are meal-content. Going without your Diet Dr. P – oh, I am grieving with you – that is hard. No chocolate – that is hard, too! But am excited for you because YOU are excited! No eggs? Sad life. Hoping that after next Friday eggs can slowly return to your world! It would be more challenging with kids in the house- Jen (the author of the book) kinda sorta had her kids follow it, within reason I think. Ish. Thanks for being excited with us! Can’t wait to see what happens with all of this! Go Jesus Go! And thanks for the comment. Blessings, sister! Congratulations as you share here at “Tell Me a Story” about your 7 food diet progress. I can understand about you wanting cheese, because it goes so well with eggs and other things. Thanks Hazel! Appreciate your feedback. And yes, eggs and cheese go well together– but it’s doing wonders for my spiritual and physical self. Excited to see how this ends up. I haven’t heard of this one…is it primarily sacrificial in purpose? Are you loosing weight? Either way, you chose wisely..eggs are soooooooooooooogood for you!! 185 is my guess.